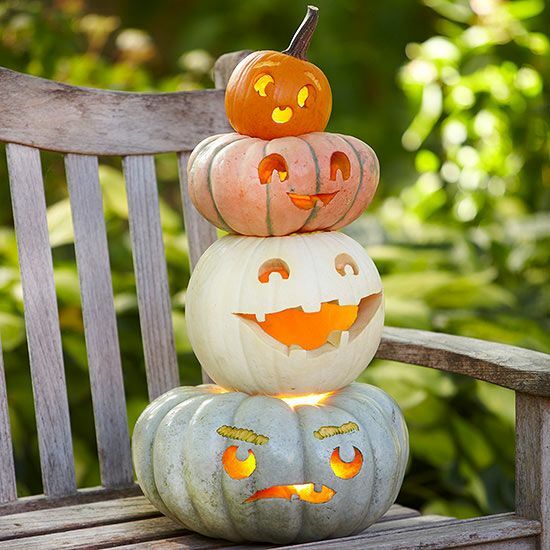 It's Bev from Flamingo Toes here this week with some fun Pumpkin Carving tips! Every year my family and I have a pumpkin carving competition. It's one of our favorite traditions! We each pick a design and keep it secret from the others. On carving night we clear a huge space on the living room floor, pop in a movie and all carve our pumpkins, but we don't let each other see what we're making. When we're finished, we have a big reveal and light them up! Then we take photos and post them on Facebook so friends and family can vote. The winner gets to choose a restaurant to go out to eat to celebrate! It's so much fun and my favorite part of Halloween. I've gathered up some of my favorite Pumpkin Carving tips and tricks to share with you all, just in time for Halloween! Carving the hole: If you carve your hole at the top, make sure you're cutting at an angle, in towards the center of the pumpkin. This way, the top sits in the hole - if you carve the hole with your knife pointing straigt down, the top falls right into the pumpkin. (which we may or may not have done on occaision). Carving the hole at the bottom is another option.! It makes the pumpkin sit straight and it's super easy to add a light, you just set the pumpkin over it! For scooping out seeds: We've found that metal spoons work best. In ice cream scoop or large serving spoons are great for this. If you also scoop out some of the sides, this will make carving easier. 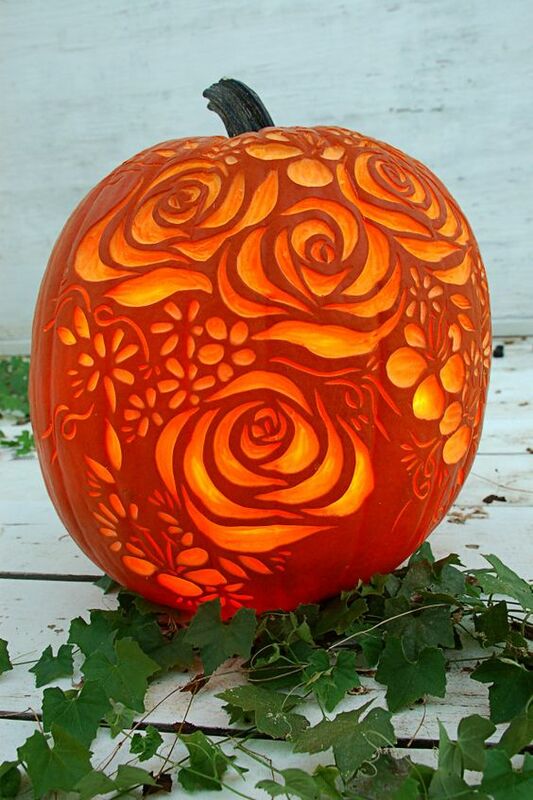 You can also do some really fun things with partial carving if the pumpkin is thinner. Just scrape away portions of the outside in a design to let the light shine through. It makes for a really pretty effect! 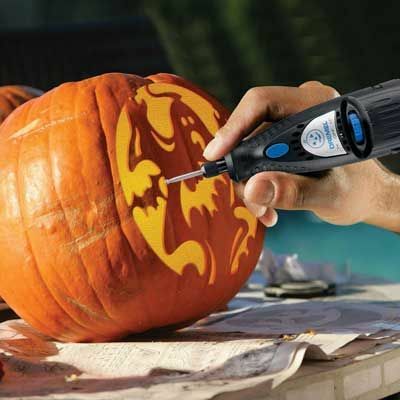 For cutting: We use the little knives that come in the pumpkin carving kits. They have small blades that work well for carving delicate designs and they're easy to handle. If you're wanting to do really advanced designs, a dremel and/or drill work great too! Fixing an oops: If you are cutting a delicate part and accidentally cut too far, you can easily add back in the section by connecting the open part with the part you cut off with a toothpick. If you need to, break the toothpick in half for really tiny sections. It works great! Battery operated tea lights are our favorites! These little tea lights are so inexpensive now and you can even find styles that flicker. They last for a long time and you don't have to worrry about open flames or the flames blowing out. Easy peasy! Battery Christmas Lights: Thre are some really fun battery operated Christmas lights now so you could light your pumpkin with different colors, or even flashing lights! Just for fun: If you use a real candle or tealight to light the pumpkin, sprinkle a little cinnamon or pumpkin pie spice on the inside of the lid. It will smell like a pumpkin pie! Preserving: Petroleum Jelly: Rub the open areas of the pumpkin with vaseline or the generic equivalent - this will keep them from drying out quickly. Soaking: If your pumpkin still gets a little shriveled, soak it in a cold water bath for up to eight hours to help revive it! We'd love to hear any tips you have too!